Why the KitBest Portable Mini Bike Pump? KitBest portable tire pump is compatible both for Presta and Schrader valve, even you can use it for the stroller tire. Cycling pump is not only lightweight , but also portable to attach to your bike with the bracket clip. 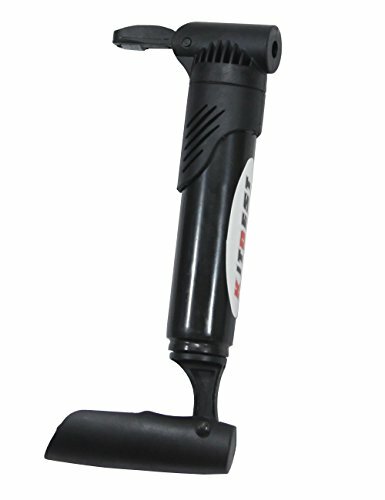 KitBest bike tire pump is made of the PVC material guarantees the durability. Pump sports balls and balloon easily and effectively with the air inflation needles. PVC Bicycle pump barrel, ULTRA DURABLE design and EASY TO CARRY. – Mini bike pump is small enough to easily fit in your bike bag or bike basket. You will be able to deal with a flat tire outside anywhere and anytime. EASY TO USE – Up to 100 PSI capacity that allows you to use the bike mini pump to inflate the bike tire from mountain bike (MTB pump) to road bike (Road bike pump). In addition, this bike hand pump can be used as ball pump to inflate the sports balls with the air needle as well. DO NOT RIDE WITHOUT IT, it is an indispensable part of bike accessories for you! A FULL RANGE OF ACCESSORIES: air needle to inflate the sports balls, Mounting bracelet to attach the pump on the bike and downloadable user manual (https://drive.google.com/open?id=0B2i2ZQnOEzFyZUhIVmhIVU1SSm8). We are committed to provide excellent customer service of KitBest Bicycle Pump with our UNCONDITIONAL Free Replacement or Money back guarantee for a period of 3 years.